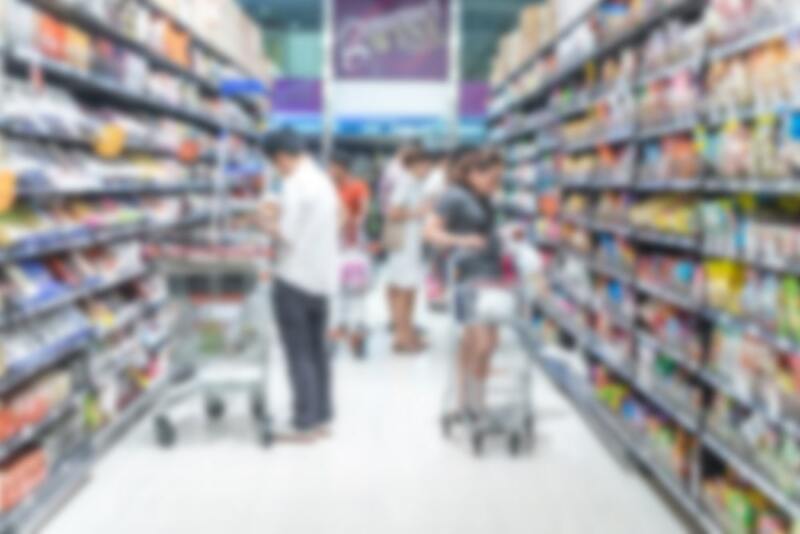 While late nights, early mornings, and Wednesday afternoons are actually the three best times to shop for groceries, sometimes scheduling your shopping trips to align with a smaller crowd is simply unrealistic. And when the supermarket is at its most swamped – midday on weekends and between 4 and 6 p.m. on weekdays – is often when you do have time to shop. If the grocery-witching hours align with your shopping schedule, you can’t go in empty-handed. Instead, take a look at these grocery shopping hacks for keeping your cool when the supermarket is swamped. This first grocery shopping hack is the one you should always remember, whether the supermarket is crowded or not. Repeat after me: Never. Shop. Hungry. Take it from someone who knows, grocery shopping with an appetite will only mean one thing – you will end up with more food than you need, and a few snacks that you’ll likely devour in the car. Grocery shopping hack number two? Never shop hangry. For those that don’t know the difference, hangry is the feeling that erupts when you’re so hungry, you’re irritated. Hungry + angry = hangry. Hangry + grocery store = disaster. Do yourself and everyone in a three-mile radius a favor and eat a hearty meal or snack before shopping. It’s important to involve your children in food and shopping experiences, as it helps to create curiosity and interest around new and unfamiliar foods. However, there’s a time and place for a learning experience, and it’s not always in the swamped cereal aisle. We know firsthand that it’s not always easy or even possible to leave the kids at home when it comes time to grocery shop. But, bear in mind that a crowded store will likely affect your little one even more than it does you. So if you can, try to leave the kids at home. Grocery shopping hack 101: come with a shopping list. Large crowds, loud stores, and bustling aisles have a tendency to make you forget that one item you promised yourself you would remember. The easiest way to circumvent a still-empty pantry is to come prepped with a shopping list that you can hold yourself accountable to. If pen and paper aren’t your thing, try building your list on a smart shopping list app like Basket. This way your list can live safely on your smartphone, and you can check off items as you shop. How many times have you seen the shopper in front of you walk into the store, grab a sales flyer or weekly circular, and then slowly creep to a screeching halt before even reaching the first aisle? Don’t be that guy (or gal). In a store that’s already crowded, stopping short to peruse the sales flyer is just not a good decision. Instead, consider this grocery shopping hack: most retailers put their weekly circular on the website so you can access it at any time before entering the store and plan ahead. The same goes for coupons. Make sure you review and stack up on any coupons you’ll be using on your shopping trip to easily streamline your experience. The middle aisles are stocked full of the sugary, carb-y, and delicious things we likely shouldn’t be eating. The perimeter aisles will have all of your grocery list staples, including dairy, produce, bread, and deli. Before you drive yourself crazy weaving in and out of every aisle, do a big square around the store to collect your essentials. Is one of your biggest peeves of a crowded supermarket the shoppers who accidentally collide right into you with their cart? It’s time we all mind our supermarket etiquette. The rule of thumb is, control your shopping cart the same way you would your car. In the U.S., we drive on the right side of the road. When you’re turning onto a new aisle, stay along the right side (unless there’s another shopper in your way, of course). The same goes for turning out of an aisle or exiting the deli counter. Think of these areas as traffic intersections. If there’s already a shopper coming your way, give them the moment to pass the aisle before you come barreling out; they have the right of way. Of course, not every shopper will think to follow these guidelines. But being mindful and respectful to other shoppers around you helps you stay calm in the crowd. We’ve mentioned this grocery shopping hack before, and we’ll say it another 100 times if we have to. Just because something is marked on sale, does not mean you need it, nor does it mean you’ll actually be saving on it. If it’s an item with an expiration date a day or two from now, and it isn’t on your list, you likely won’t use it before it spoils. If you think you might need it, take a look around the shelf or scan it on the Basket app to compare prices. Despite being labeled “sale,” it might not be the cheapest option and you’ll waste time you probably don’t want to spend in-store. Once you’ve made your way to the cashier, choosing the fastest checkout line is the last obstacle you’ve got to face. This is where your judgment really comes into play. There could be three people in line A, but with only a handful of items each in their carts. There could be one person in line B, but with enough groceries to feed a small village. Go for the longer line, it will be faster. 25 items in your cart? Skip the 10-Items-Or-Less Express Line. Just don’t do it. You will likely be asked to exit the line. Cashier bagging all of the groceries? Place items in the order you want them to be bagged. We know, you’re probably used to loading all of your items onto the checkout belt at once. But that will likely lead to softer items getting squished, and more time spent by the cashier trying to bag like-items together. Instead, place items in the order you want them to grouped. Start with your heavier items, like juices and cans, then add your boxed and container foods. Finish with the softer and breakable items like bread and eggs, this will help protect them on the ride home. Plus, this takes the guess work out of the cashier’s job, speeding up the checkout process and getting you out of the swamped supermarket quicker. Last but not least, stop to smile. The least intuitive grocery shopping hack, nothing will help you more in a crowded grocery store than having a positive attitude. Science has shown that a simple smile releases chemicals called neuropeptides that not only fight off stress, but also relax your body. Plus, smiling is contagious. Find simple things to smile about, like passing another shopper or greeting the employee at the deli counter. Yes, the store might be crowded, but you decide how you react. Choose to smile. Is the swamped supermarket stressing you out? Geared with these grocery shopping hacks, tackle each aisle with ease.